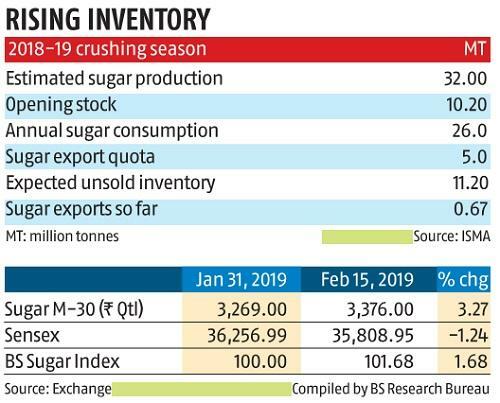 While the hike of Rs 2 a kg in the minimum selling price (MSP) of sugar to Rs 31 a kg is unlikely to have any medium-term impact on the domestic sugar sector, bogged down by a global glut and rising inventories, the central government’s deft move would nonetheless exert pressure on the private sugar mills to clear farmers’ arrears. Now Rs 31 a kg ex-mill becomes a benchmark for wholesale market price. In the crucial election year, with the Lok Sabha polls merely a few weeks away, the extra elbow room provided to mills in the form of the seven per cent hike in MSP pitches the Narendra Modi government in a much comfortable position, while supplementing its self acclaimed pro-farm agenda, which also manifested in the liberal agricultural sector doles in the Union Budget 2019-20. Although, the MSP hike improves the realisation of the beleaguered mills in the backdrop of outstanding for the current 2018-19 crushing season rising to almost Rs 22,000 crore, yet it remains below the average cost of production, which the private millers peg at almost Rs 34/kg. 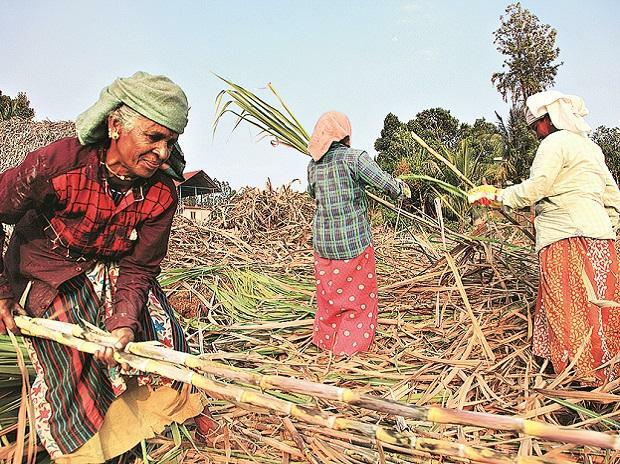 However, coupled with sugar and realisation from sugarcane byproducts, such as bagasse, ethanol, cogeneration etc, which account for nearly 15% of total realisation by an average sugar complex/unit, the current level should be sufficient to settle arrears. Care Ratings deputy general manager (corporate rating) Gaurav Dixit said the mills would get some extra liquidity (estimated Rs.6000 cr) and there would be some “sentimental impact” to expedite the payment of arrears, but the medium-term outlook on the sugar sector remained negative since sugar production would be quite high resulting in further stockpile. “Recently, there has been some unrest among the farmers regarding arrears and this hike would provide some extra cash with the mills to pay farmers, while also ensuring that the sugar prices do not crash over the next 2-3 months,” he added. Currently, UP, which is India’s top sugar producer, accounts for nearly Rs 10,000 crore of total outstanding. “The hike would give us some leeway regarding our working capital requirement. In fact, the big groups stand to benefit more from this hike than smaller and standalone units like us,” K M Sugar Mills chairman L K Jhunjhunwala told Business Standard. A senior official with a leading sugar producer in UP on the condition of anonymity said the move puts mills at the “marginal position” and allows them to clear arrears, especially in the backdrop of the sugar recovery of private mills improving to nearly 11%. Sugar industry veteran K P Singh, who was formerly associated with Balrampur Chini, which operates 10 mills in UP, said although the breakeven point for the mills came to about Rs 33-34/kg, yet the mills could comfortably settle their payment commitments at this MSP level, although he asserted they would not make any profit as well. Maharashtra, second biggest sugar producing state after UP has also seen huge arrears payable to farmers and mills were unwilling to pay. However, after sugar commissioner of the state started issuing recovery notices, mills have come forward for payment and in last two weeks, huge amount is said to have been paid. The issue is of lesser demand and mills are not able to sell sugar enough to meet their monthly sale quota released by the government. The government has mandated industry to export 5 million tons of sugar in the sugar season Oct-18 to Sept-19. However, so far 0.67 million tons has been exported till 6 February, according to data compiled by logistic company Dr. Amin Controllers Pvt Ltd. 0.43 million tons of sugar dispatched from mills but in various stages of exports. Total exports considering this comes to 1.1 million tons. Exports picked up momentum in the last one month. Sri Lanka, Somalia and Sudan are the biggest destinations with 0.52 million tonne sugar exported there. However, till March end, this price is less likely and exports will not be much. Hence, in March quarter results, exports revenues of sugar mills will not reflect that.